The original Jackie Robinson professional baseball contracts while he played for the Brooklyn Dodgers and Montreal Royals, together valued at $36 million, are slated to be sold at a Live Auction on January 31 in New York City. The two items went on sale yesterday during Martin Luther King Jr. Day running until the 100th anniversary of the deceased baseball and civil rights legends birthday. The Sports Techie community blog is honored to share this opportunity with our readers and followers. The two contracts are to be sold together with the opening bid expected to be $5 million. The Jackie Robinson Foundation gets ten percent of the sale price. Media can view the historic color-barrier-breaking contracts tomorrow, January 23, from 12:30-2:30 in New York City. The Jackie Robinson Foundation (JRF) is a public, non-profit organization that administers one of the nation’s premier education and leadership development programs for minority college students. A Brooklyn historian’s safe-deposit box was finally opened several years ago containing Robinson’s contracts. The contracts have since been shown the past three years at several museums and major-league stadiums such as the National Constitution Center in Philadelphia, City Hall in Montreal, Times Square in New York City, Busch Stadium, Wrigley Field, and others. “There are many documents on display in museums that represent seminal moments in history which forever changed America, such as the Declaration of Independence, the Gettysburg Address and the Emancipation Proclamation. But most historians believe the integration of baseball with the signing of Jackie Robinson had as great an impact on America as any other moment in history. In fact, Martin Luther King called Robinson the founder of the Civil Rights movement,” said Ken Goldin, chairman of Goldin Auctions. 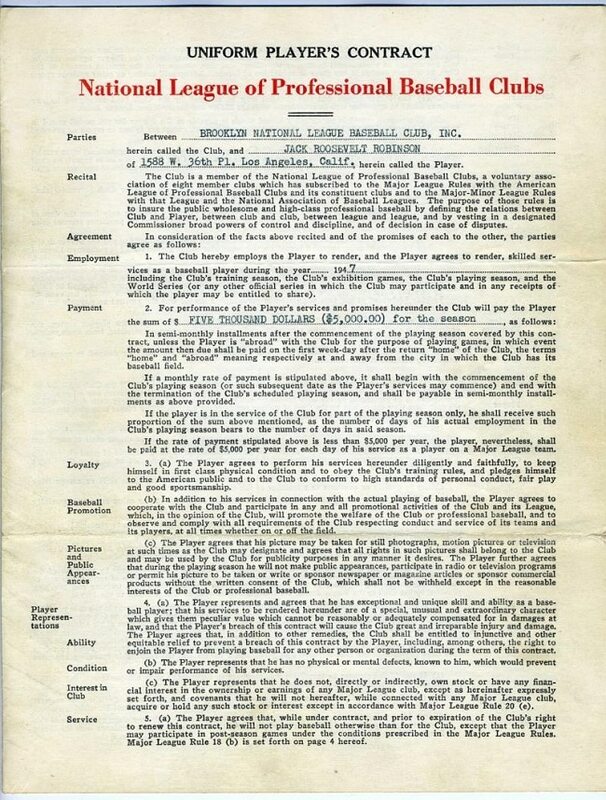 Baseball and civil rights historians as well as serious collectors and hobbyists can join in the rare auctions for Jackie Robinson’s 1947 Brooklyn Dodgers’ contract and 1945 Montreal Royals’ contract. “We encourage philanthropists, museum curators, MLB team owners, corporations and anyone else with the means who loves baseball or supports the civil rights movement or wants to help preserve Jackie’s legacy, to step forward and take ownership of these historic documents,” said Goldin. The auction opened online January 21, MLK Day, then closes with a live event in New York City on January 31, the 100th anniversary of Robinson’s birth. All interested bidders are required to register in advance to obtain approval to bid. Individuals, corporations, foundations or any other parties interested in purchasing the documents in advance of the auction at a mutually agreed upon price and guaranteeing a permanent public display should contact Goldin Auctions at info@GoldinAuctions.com or 856-767-8550. Goldin Auctions is also accepting consignments for its upcoming Jackie Robinson Centennial Auction-celebrating the 100th anniversary of Robinson’s birth. The Sanctuary Hotel is hosting the media viewing on West 47th Street in NYC, March 23. RSVP is appreciated. Robinson signed the first contract on October 23, 1945, with the Montreal Royals then on April 11, 1947, with the Brooklyn Dodgers. Authentication was handled by James Spence Authentication (JSA), Beckett Authentication Services and John Reznikoff of University Archives. The documents were appraised for $36 million by rare document expert Seth Kaller. He also appraised comparable historical items like Abraham Lincoln signed copies of the Emancipation Proclamation and signed copies of the U.S. Constitution by Benjamin Franklin. The contracts are currently insured and appraised at $36 million by Chubb. Number 42 left a lasting legacy in many ways. 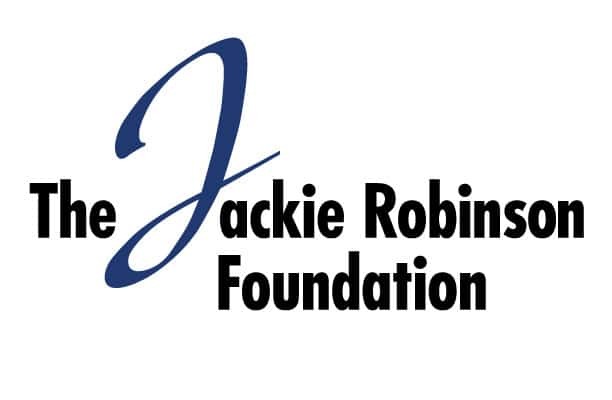 The Jackie Robison Foundation (JRF) was founded in 1973 by Rachel Robinson as an ongoing tribute to the memory of Jackie Robinson. JRF is a public, non-profit organization administering perhaps the the nation’s premier education and leadership development programs for minority college students. In addition to four years of generous financial assistance, JRF offers an unparalleled, comprehensive set of support services that has led to a consistent, nearly 100% graduation rate among African-American college students. The 1,500 JRF alumni are proven leaders in their communities and across a broad range of professional fields-serving as true ambassadors of Jackie Robinson’s legacy of service, excellence and humanitarianism. JRF has disbursed over $70 million in grants and direct program support to students who have attended over 260 colleges and universities across the country. The Jackie Robinson Foundation is engaged currently in building the Jackie Robinson Museum to educate and inspire visitors of all generations around Jackie Robinson’s courageous achievements on and off the field. For more information, visit www.jackierobinson.org. Sports memorabilia impresario Ken Goldin has sold more than $600 million in memorabilia from many of the biggest names in sports, history and pop culture and was the pioneer of using the medium of television to sell sports memorabilia. Goldin Auctions strives to break new ground and offer collectors the best in collectible treasures up for auction in the marketplace. All game-worn or autographed items come with team, player, league or additional LOA from industry-leading authenticators, and collectors can bid with confidence that their proxy/ceiling bids remain confidential. For more information, visit www.goldinauctions.com. Sports Techie, MLB took a major step forward when Dodgers President and GM Branch Rickey broke the existing color barrier around since the 1880s and signed Robinson, truly an impact player Rickey was also in favor of analytics and using pitching machines, batting cages and batting helmets. Spring training is right around the corner. My son and I attended the Atlanta Braves Chop Fest this past Saturday at SunTrust Park and the Battery and loved it even if it it rained. I love how the rich history of the Braves is proudly displayed throughout the amazing ballpark. A conversation about African-American baseball players that impacted both the game and society after Robinson has to include Braves legend, Hank Aaron. The color barrier in baseball fell in large part to Jackie Robinson. The U.S. and world are better places because of it. Start your online bidding at Goldin Auctions now on these rare pieces of sports memorabilia and human history. The investment is priceless to the right bidder.